Travalo : Have you ever wished you could have a quick freshen up when you're out and about? Travalo is a refillable atomizer bottle with a difference. Its patented easy fill system allows you to refill in seconds with a simple repeat pump action. Travalo makes it easy and convenient to have a fresh confidence boost any time, anywhere. (Read More) . I was sent the Green Classic Excel to review. When Dawn pitched through E-mail to review a Travalo I couldn't resist! I don't know about you but I am a huge perfume fanatic. I love to smell good, and love when my husband smells good also. I think wearing perfume and cologne should always be part of every ones daily task. I have to admit I and my Husband (sometimes) get in a hurry and leave the house without soaking ourselves in our favorite perfumes, and colognes.. (It happens) I have tried the whole sticking my husbands cologne in the storage departments in our car, but that always had a bad side effect, such as it gets too hot. And my perfume bottles are way to big and bulky to stick in my purse. Over the years I have saved my favorite perfumes bottles because of missing bottle heads, or the perfume tubes are not long enough to reach the bottle of the remaining perfume on the bottle of the bottles. I have saved them all these years and had no idea why until I was offered to review the Travalo . I knew exactly why I kept them In the short time that I have tested the Travalo. It has become my purse's Best Friend. 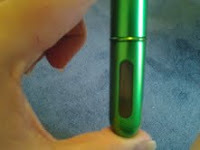 I go no where without my Travelo since I received it in the mail. I now can smell good no matter where I end up while out and about, I love whipping out my discrete charming Travalo and spraying myself with my good smelling perfumes. I have about 20 sprays (I spray heavy) before I have to refill my Travalo. I have gotten many compliments since reviewing it, mainly in the womans bathroom! the Travalo is welcomed onto air planes. Which is a plus. I also love that the Travalo also comes with a cute little storage case (as shown in photo). My Travalo is so cute and compact. It is so EASY to use! I was actually shocked how easy it was for such a small little gadget. You simply pop the head off of the perfume bottle stick the (END) of the Travalo (the other end not the cap end) onto the perfume pump stick and pump until the travalo window is full (as shown in photo) Simple right? .. I thought so! travalo takes no more space in pockets, purses, or other secret areas than a Tic-Tac box. The Travalo comes in several colors. I hope to see different Travalo prints, and my favorite would be pink leopard and zebra prints. (Smiles) ..Hint Hint! but for now you can find amazing colors in green, red, pink, blue, and more. ♥ I receive no monetary compensation for this review. I was provided a Travalo to try and give my honest opinion.